We hope that you found your experience to be rewarding both personally and professionally. By reporting your activity, you are helping us to show our supporters that the Ambassador Speakers Program is making a difference! Please complete and submit the form below if you used the Ambassador Speakers Program services or tools to aid in your presentation. Ag Bag: This contains examples of agricultural products to show how agriculture affects our everydays lives beyond food. A great attention getter for students. Keep and use for all your presentations. Please fill out a form for EACH presentation request, no limit. To improve likelihood of filling requests please indicate if multiple class sections may be combined? (Ex. : If you have 4 classes of 25, could we combine to do 2 programs for 50 students). If the classroom is not equipped for presentations, please discuss with your ambassador. Complete and submit this form to the Ambassador Speakers Program. A Program coordinator will contact you with more details of the activity you’ve selected. Do you have access to a laptop and LCD projector for the presentation? Suggestions for New Ambassadors – please provide names and email addresses below. Our speaker Carly was wonderful! I can’t say enough great things about her! She brought in materials that the kids could touch. She related her PowerPoint message to the real world and she was VERY well prepared! The kids learned quite a bit from her and there’s always something neat about someone else teaching, especially on a topic that is specialized. 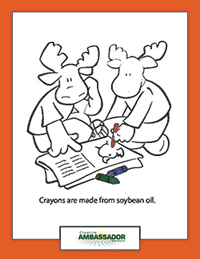 These coloring pages will help young students understand how they are connected to agriculture.